Premier Wen Jiabao is back in Sichuan's earthquake-savaged counties again, and he reportedly has decided not to rebuild the largest town in Beichuan County destroyed by the quake on May 12. Sources said that the town's towers of rubble now will be built as a memorial park in place for generations of future visitors to witness. Tucked in a steep river valley atop the unstable Longmen Fault, the onetime Beichuan town of 20,000 is in too vulnerable a location to rebuild, officials said. "Experts say the only option is to move the town and keep the remains," said Zhang Jie, press spokesman for Mianyang municipality, which oversees the town. The State Council, which Premier Wen heads, will make a final decision on whether to turn Beichuan into a memorial by the end of the month, Zhang said. He added that survivors of the quake in Beichuan have been relocated to the nearby cities of Mianyang and Anxian and will not be permitted to return to their former home. Soldiers are guarding entry to the ruined city, barring access due to fears of infection and concern that a river blocked by landslides above the town, forming two lakes, may suddenly burst, letting a deluge down the valley. 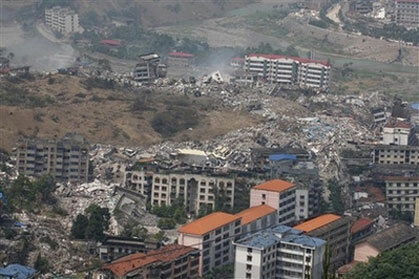 Of Beichuan Town's former inhabitants, about 8,600 are known to have died and another 5,894 remain missing. The rest appear to have survived. China won't be the first country to seal off a town devastated by natural disaster. In 1985, a volcanic eruption melted an icecap on an Andean peak, triggering a mudslide that buried the town of Armero in Colombia, killing 23,000 people. The site of the buried town was later declared "holy ground" and turned into a commemorative park. A huge memorial at Beichuan might be a fitting tribute to a calamity that is likely to be seen by historians as a watershed moment for China, an event that saw the nation mobilize in massive numbers to help the victims, and possibly a hiccup in the ancient eastern country's endeavor to regain economic prosperity. Tens of thousands of ordinary Chinese volunteers have flocked to the quake zone in Sichuan Province to offer varied services. "People are giving their help in any way they can. If they have money, they are giving money," said Zhu Chujun, who is part of a volunteer team from the eastern city of Hangzhou offering psychological counseling to victims.